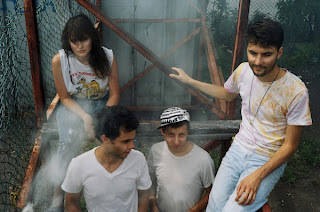 Windy City Rock caught up with Montreal's twinkling soft-rock outfit TOPS, who strolled into Chicago this week for two shows- last night at The Empty Bottle and tonight (Thursday) at The Burlington. Touring in support of their debut release Tender Opposites (Arbutus Records), the band excels at crafting tight, kinetic pop songs and spacious, fragile ballads. While it's easy to draw comparisons between TOPS and current/former label-mates Grimes and BRAIDS, the truth lies somewhere in between. Absent is the heavy gloss of the former, and the obtuse structures of the latter. The result is an easily digestible album riddled with catchy melodies and smart songwriting. The band's personality seems to share that dichotomy; a charming combination of whimsy and thoughtful perspective. You can catch TOPS at The Burlington on Thursday, September 27th ($7, 21+). In the meantime, enjoy our chat with Jane Perry [vocals/keyboards] and Riley Fleck [drums]. WCR: To start, where did you all meet? How long have you been playing together? JANE: We all came to Montreal a few years ago, David [guitar] and I both came from Edmonton and knew each other from before, everyone else met hanging out and going to shows. We had been playing music with Thom [bass] for a couple years, he used to play drums with us and he wanted to play bass instead, so we asked Riley to jam with us at La Brique to see if it would work out. We got together and played some songs that David and I had started. It was really easy right from the start to finish songs and play together, so we decided to make a band out of it. That was a year and a half ago. WCR: What role has living in Montreal had in shaping your sound, if any? JANE: We all came to Montreal to make music and meet other people that make music. Montreal is great because people don’t have a lot of money and don’t aspire to. There’s a lot of creative people, and a lot of opportunities to dance and get fucked up. WCR: What's your process like, in terms of songwriting? RILEY: Dave or Jane usually bring a skeleton of a song—like a melody or chord changes—to practice and we all play and arrange these songs until the skeleton has flesh. A focused band jam is important to our sound, but sometimes we create zombies. WCR: What emphasis do you place on visual aesthetics- album art/packaging, videos- in an age in which the majority of listeners get their music digitally? JANE: That stuff is important, and can be really cool. None of us are visual artists, so we get friends to do stuff for us. I’ve been really into filmmaking in the past, and we’re all interested in it, so in the future I think we’re going to make all of our music videos ourselves. Videos are best when they’re either personal , conceptual or just really visually interesting. WCR: If 16 year-old you made me a mix tape, what would be on it? RILEY: The Grateful Dead, NIN, Aphex Twin, Nirvana, Death Wish Kids, Led Zeppelin, Beck, IDM and Radiohead. And West Side Connections. WCR: Halloween is coming up. If you could be another band for a day, who would you be? JANE: That’s tricky. Maybe like Heart or Patti Smith. Or some really popular stadium rock band from the '80s. WCR: Are there any artists you'd really like to hear cover TOPS? RILEY: Probably a friend like Sean Nicholas Savage or Raphael from Blue Hawaii because it would be really special and a big compliment to the song. WCR: Aside from a shared sonic palette, what unites the songs on Tender Opposites? JANE: Well, they are the first songs that we wrote together and they were written in a time-frame when we were all into similar music. David and I wrote a lot of the songs about feeling alienated but not really caring, about people’s egos and about love. WCR: The album is pretty tightly crafted, but still feels open, limitless in possibility. How do those songs translate to your live performance? RILEY: We recorded the album ourselves, so the recordings sound a little smaller and more minimal than they do live, which is something I like personally, having the live set be a little different. I guess the live show is a lot louder, a little bit heavier and usually pretty fun. WCR: If TOPS were edible, what would you taste like? RILEY: Water in a desert. WCR: And, finally, the guidance counselor special: Where do you see yourself in five years? In ten? JANE: If I get enough money at some point, I’d like to buy some land and build a small house on it, get a dog. I guess that’s a ten year plan. TOPS definitely has some more ideas left in it, there are some concepts that I associate with the band that I think can still be explored a lot more, so yeah, playing lots of music and recording some new songs. Again, you can check out TOPS tonight, Thursday, September 27th at The Burlington on ($7, 9pm, 21+). Check out the single "Turn Your Love Around," from Tender Opposites.